If you are thinking of renovating, planning an extension or even just changing doors, pretty soon you are going to have to consider paint colours. Some people dread the thought of making such a big commitment. With so many choices out there it can be overwhelming. But with a few simple tips we will have you choosing exterior paint colours with confidence. Define your style within the context of your surrounding neighbours. Try to consider how you want your home to look from the street. Do you want it to stand out as a statement piece that becomes a local landmark? or would you prefer a more subtle palette that blends into the landscape? For something bold, consider darker shades to really draw the eye. if you’re after something a little softer, pale hues work best. Your home may look like a patchwork quilt for a few weeks, but it is worth sampling a range of colours before you commit. We recommend buying sample pots in a few different shades and painting large swatches in multiple locations. Near your outdoor entertaining area and the front entrance are a good idea. The strength of natural light can vary in different locations, and it can change the way the colour looks at different times of the day. TIP: Don’t forget to do 2 coats with your sample pots. the trim colour used for windows, fascia and other trimwork. Your main colour should contrast strongly with your trim colour. If your wall colour is a dark charcoal, consider the ‘pop’ of the classic white trim. A light wall colour can look amazing against dark trim…like eyeliner for your home. Ensure you explore the options and check out Pinterest for inspiration. Remember, exterior paint colours are not just limited to the house. Your home sits within a landscape. So it should feel as one and give it a sense of place. Consider your fence, any retaining walls, paving, concrete and external structures. Is their existing colour palette harmonious with the proposed? If you are still unsure about what to choose (and paint colours can be soooo diversive between couples), then it’s worth talking to a Colour Consultant. Costs are quite minimal, especially when you think about the pain of repainting if you hate it. Usually, you save on the cost of the paint if you use their recommendation, but check with your paint retailer. Most of the major paint brands also have arrangements with consultants. Dulux Colour Consultants can help bring your home to life. Choosing to refresh your home with a new exterior paint colour, can almost feel like you have a new home. 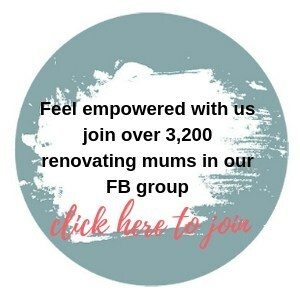 Join us in the Renovating Mums Facebook Group to ask for advice or share your colour palette ideas with other like minded mums.